Perhaps it wouldn't be too far-fetched to say that Sharon Osbourne had an affair with Billy Idol. New updates on gossip daily! the tattoo on her forearm is totally ridiculous. it looks like a stamp. 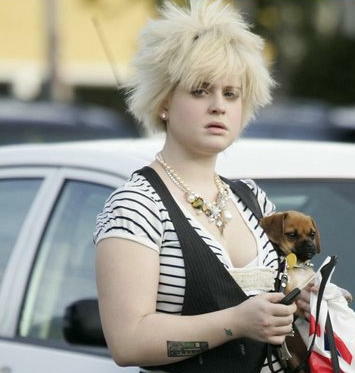 Even lugging that poor dog around doesn't detract from the fact that she looks like a walking dandelion. Just blow on her head and make a wish.....hopefully that she will get a mirror. Naah... Billy Idol was slim! I'd take Kelly over recent Britney in the style department ANYDAY. At least Kelly covers up for the most part and her skin doesn't look like a 50 year old dart board. i really wished kelly reads all of this, Kelly you are pathetic!!! !